When I think back to my childhood in the eighties, the Barbadian chattel house is one of my brightest memories. These tiny, wooden structures were distinctive landmarks dotted around a country that had left most of its slavery past behind. 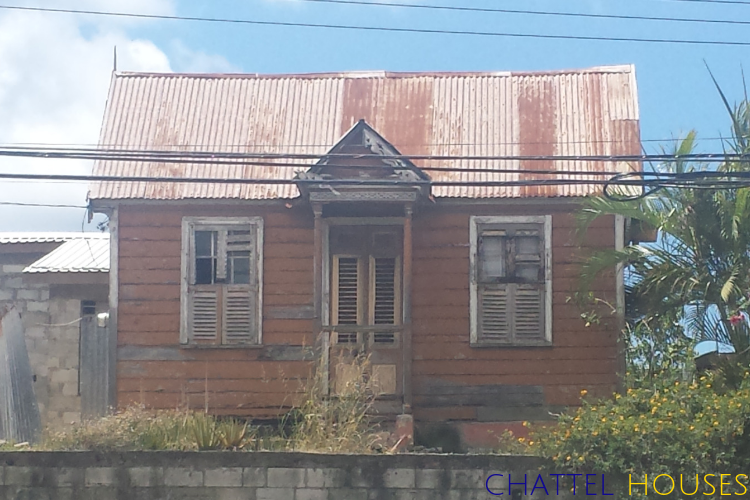 If I had known then that the chattel house was a strong symbol of freedom, I may have noticed that they were disappearing from the Barbados landscape. But now that I’m older, I have developed a great appreciation for the Barbadian chattel house, what it represented to my ancestors and what it means to Barbados. Many now view the chattel house as a home for the poor, which is simply not true. It just so happens that some poor people live in chattel houses. But what they missed financially, did not diminish their strengths in other areas. Chattel houses were born out of a need for affordable yet mobile housing solutions. The slave trade was abolished in Barbados and other British owned territories in 1834. After the slave trade ended, plantations rented pieces of land to workers so that they could construct simple, yet functional homes. One of the requirements of the houses was that they had to be moveable. Hence the term “chattel” which means “moveable possession”. And, because plantation owners could evict tenants and the workers had the right to move to different plantations for work, the chattel house was the perfect solution. The design of the Barbadian chattel house was perfect for a climate which consisted of sunshine throughout the year. The house itself was small, and was constructed out of imported pre-cut timber panels which could be easily assembled or disassembled as needed. This also allowed for easy transportation from site to site. Chattel houses were not affixed to the land. Instead, they were built on foundations made of loose rocks or coral stones. The rocks and stones were packed firmly together and elevated the chattel house by as much as four feet. This practice was done so as to let air circulate underneath the house for cooling purposes. The roof of the traditional chattel house was a four sided hip roof or the very steep gabled roof. These designs were intended to deflect wind from lifting the roof off of the house. Roofs were typically symmetrical and were constructed of corrugated metal sheets which are known locally as galvanise or galvanise sheets. Chattel houses were built symmetrically, with a front door flanked by two windows. The original homes were tiny with estimated dimensions of ten by eighteen feet. The house was basic with one or two rooms and was mainly used as sleeping quarters. Other one for sleeping and the other was a living or common area. Cooking and bathing were done outside of the home. The outdoor kitchen was quite different back then because people cooked on wood fires. because there was no electricity, food was always fresh and free from preservatives. Bathrooms consisted of an outdoor pit toilet in a small, enclosed structure and a tub or basin set on the ground for bathing. The older chattel houses were enhanced with decorative accents, many of which served dual purposes. Windows were louvered or jalousied and allowed wind to enter the homes when they were closed. Window hoods offered additional protection from the rain and gave shade at specific times during the day. If you closely at many of the older chattel houses, you will see that there is intricate fretwork adorning them. This fine detail was added to provide additional shade, but it is a brilliant architectural feature that has added a distinctive quality to the home. Unfortunately, chattel houses are being replaced with modern, concrete structures with firm foundations. People are opting for larger homes (and more expensive) with more space and features. But, many of them are using aspects of the original chattel house to architecturally enhance their new homes. The traditional Barbadian chattel house is a an icon that represents the resilience of a people freed from the bonds of slavery. It was one of their earliest rights to home ownership and independence. Some stakeholders have accepted this iconic stature and have utilised chattel houses as businesses and tourist attractions. Are you interested in building a chattel house in Barbados? Purchase one of our affordable chattel house plans or we’ll design one for you. Follow Chattel Houses on Instagram, and get a first hand view of our curated gallery of chattel houses in the Caribbean. Are Chattel Houses Hurricane Proof?